With March Madness underway, the nation’s eyes are now going to be glued to screens of all types and sizes as fans hope their team will advance. 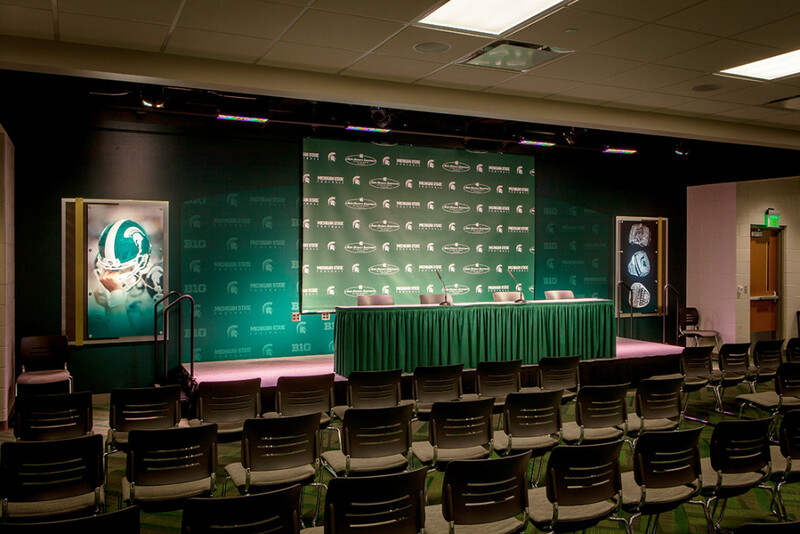 A Custom Printed Background used as a press conference background at Michigan State. Usually we take this opportunity to share a list of schools in the “Big Dance” that play or practice on Draper basketball backstops. This year, however, I thought we’d mention a Draper product that you might not even realize comes from Draper—and it’s one that is used by the team many are picking to go all the way.When most people think of a sports facility, they picture things like basketball goals, volleyball nets, bleachers, and other sports equipment. But that’s only just the start. Among the other areas of gym design, one is especially a result of the huge interest in and publicity for sports. I’m talking about custom backgrounds for sports applications. Custom backgrounds are full color graphics can be used to customize a sports facility. Michigan State University is among NCAA schools using a custom background as a press conference backdrop.